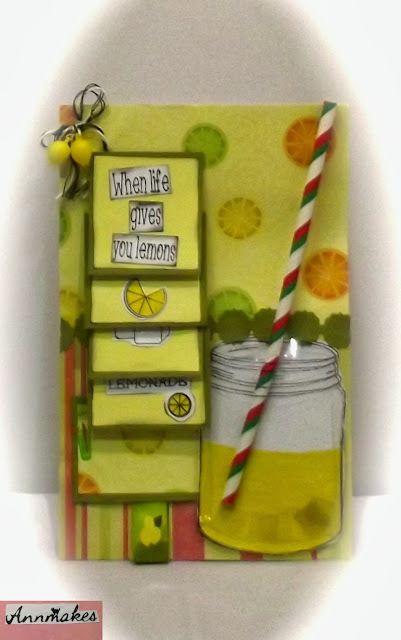 When life gives you Lemons, Make a card and enter a challenge! I won the "Interactive Challenge" at "crop & Create" in Cornwall, Ontario this past weekend and I am so pleased. I made this card using the stamps from Get Inky! by Blue Moon Creation, so a big shout out to Thia! Of course I also used a dash of Rock Candy Stickles on the ice cubes (can't see in this picture) so that's another shout out to my All that Stickles Team. I did use my Xyron to assemble this little gem which is awesome because one of the judges was the Xyron Spokes Person: Beth Kingston. I also won a great Sticker Maker from them, thank you! My card is a "Waterfall" style card with a "Shaker " element. If one pulls on the ribbon tab the squares cascade. The shaker part is the acetate ice cubes I inserted in the acetate stamped jar. The paper straw is real and removable. The little lemons on the twine in the corner also jiggle. Another shout out to my Friend Denise because I used the C.M. border maker. The papers are American Traditional Designs. The ink is Archival Black ink from Ranger. The twine and lemons are recycled from my stash. The ribbon came from JoAnne's. The Acetate is also recycled. I used Bic permanent ink markers, and Zig writer pens. There is a little brad shaped like a glass that is also from my stash. The paper straw is Crafty Basics. In addition to Xyron I used Martha Stewart's craft glue, 3M double sided tape and Stix2 clear dimensional adhesive. By the way, what a great 3 day crop event this was. Thanks to Scrapbook and Cards Magazine. Thanks for stopping by, now to go play with my new toy! ps. you were right PB.